A slightly shorter route starting in Aberfoyle. Starting in Aberfoyle this is a slightly shorter walk than the full Rob Roy Way but allows walkers to enjoy the scenery and wildlife in a more manageable time. The distances aren’t too long but you do need to be fit and a regular walker to enjoy this walk. 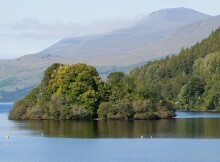 Today takes you on a glorious walk throught the Menteith hills on forest tracks and stony paths on to Loch Venachar. The last few miles into Callander encompass a very quiet minor road. Callander is a large town with plenty of shops and cafes. You will leave this town along the banks of the river Teith and walk into the highlands following an old railway line shared with cycle route 7 along the west shore of Loch Lubnaig. Your destination today is the small village of Strathyre. You will continue north on forest tracks before rejoining the railway line. Today is a varied day with pleasant views over the river and then Loch Earn. You can take an optional diversion to visit Rob Roy’s grave at Balquidder. Killin is located at the west end of Loch Tay. This section is a highlight of the trip, climbing through the forest into the hills on the southern banks of Loch Tay with fine views over the rugged Trarmacan Hills and Ben Lawyers. It passes the remote Lochahan Breachlaich before following sheep tracks over high moorland countryside, then descending again to the banks of Loch Tay. A section along the minor road leads to Ardtalnaig, a small settlement on the south side of Loch Tay. You will be transferred back to your Killin accommodation for a second night stay. You will be transferred back to the route from Killin. Today is a more strenuous day with rewarding views from a ridge linking two gorges. Using forest tracks to the Falls of Moness and the Birks o’ Aberfeldy the path down the Birks is steep in places but wooden platforms and bridges make the final descent to Aberfeldy easier. If you wish it is also possible to visit the Aberfeldy Malt Whisky Distillery or the nearby 16th century Menzies Castle. Today is mainly quiet back road walking starting fairly flat and turning more steep, but steady. You will finish with a moderate descent into your final destination of Pitlochry. Pitlochry is known for its Hydro-electric dam and ‘Fish Ladder’. The town also has two malt whisky distilleries. It is also possible to climb Ben Vrackie from here (2757 feet, 841m). 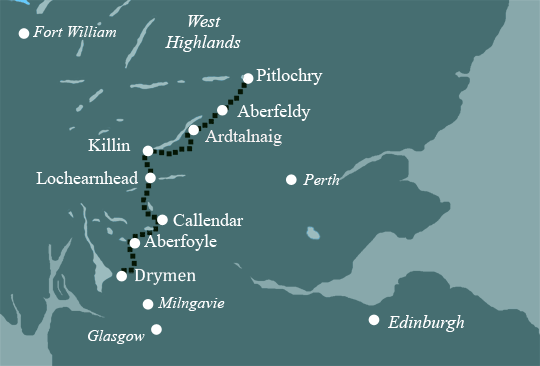 The Rob Roy is a relatively gentle walk, on generally good paths, tracks and country lanes. With some walking experience and a bit of fitness this route is pretty straightforward. Terrain: Most of the walk follows forests, loch shores, and the lower slopes of the surrounding hills. What’s it like underfoot? Generally good – the route makes use of forest tracks, cycle paths, old railway tracks, and country lanes as well as unmade footpaths. There are couple of days where the route is a bit rougher, but nothing too challenging. How Much Up & Down? Most days don’t involve too much ascent or descent, but there is one longer climb after Killin of around 400m. Signposting: None – you need to use you map & guidebook. Navigation: Pretty straightforward, on the lowland sections, but you may encounter hill fog or low cloud on a couple of sections, so you need to be able to navigate. Weather: You may be lucky enough to encounter warm, dry weather over the whole route and enjoy dry paths and tremendous views, but you must be prepared because the weather can change quickly. Good clothing and waterproofs essential! A detailed guidebook, inlcuding route description, maps, photos, and background information about the places you pass through. Maps 4 Ordnance Survey Explorer (1:25000) maps covering the entire route. Travel Insurance Even if you are based inthe UK travel insurance is worth having. General travel information on the Rob Roy Way area will be in your holiday pack including train and bus timetables where available. By Air: The nearest airport is Glasgow International (GLA) or Glasgow Prestwick (PIK). An airport shuttle bus runs into Glasgow city centre, journey time is 25 minutes. You then need to make your way to ‘Buchanan Street Bus Station’ for travel on one of the three daily buses by ‘Aberfoyle Coaches’ Coach number AC01. Visit aberfoylecoaches or Tel: 0844 567 5670 for timetable. By Public Transport: There is a main railway station in Glasgow. You then need to make your way to ‘Buchanan Street Bus Station’ for travel on one of the three daily buses by ‘Aberfoyle Coaches’ Coach number AC01. Visit www.aberfoylecoaches.com or Tel: 0844 567 5670 for timetable. By Road: From Glasgow in Scotland, Aberfoyle is 26 miles north. For the most direct route you need to follow this sequence of roads from Glasgow: A81, A739, A809, B834, A81, A821. By Public Transport: There is a railway station in Pitlochry. Travelling south you can either head for Edinburgh or Glasgow, for the north head for Inverness. By Road: When traveling back into England or Wales from Pitlochry, head for either Edinburgh (70 miles) or Glasgow (84 miles) depending on the direction of your final destination. Pitlochry is a pleasant Victorian town on the river Tummel. The river was dammed in the 1950’s and a fish ladder built to allow the thousands of salmon to swim upriver in their annual migration. There is in an interesting walk past the fish ladder and the viewing chambers where you may spot a fish going upstream, then past Scottish Plant Collectors Garden and back via the river Garry. You can also hire boats or go fishing on nearby Loch Faskally. Walk in the quiet forests of the Trossachs and Perthshire. Follow the route along numerous loch sides, with great views into the surrounding hills. Visit picturesque Callendar and the renowned Victorian town of Pitlochry.